Vintage - Tiara Crystal, 6 3/8" Round Bowl, Made by Indiana Glass Co. from 1971 to 1989, Priced Individually... Buy one or more. 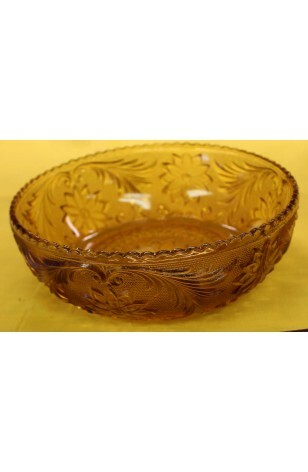 This Vintage "Sandwich" Designed Bowl, by Tiara Crystal, in the Amber Color, is from Indiana Glass, having production Dates of 1971 thru 1989. Sandwich Pattern has a Daisy Design, interspersed with Fern like Sprigs. The Bowl seems to be in almost unused condition, with no chips, cracks and/or repairs. This Vintage "Sandwich" Designed Bowl, by Tiara Crystal, in the Amber Color, is from Indiana Glass, having production Dates of 1971 thru 1989. Sandwich Pattern has a Daisy Design, interspersed with Fern like Sprigs. The Bowl seems to be in almost unused condition, with no chips, cracks and/or repairs. A Very Good Resale Condition.